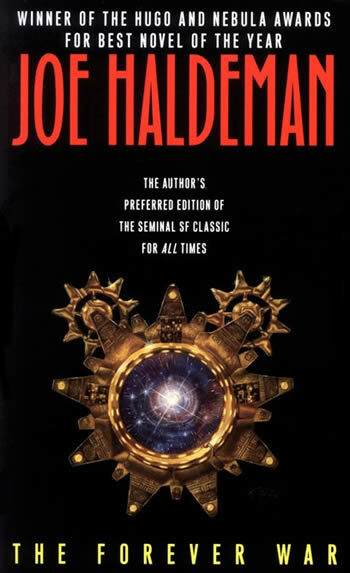 I got to meet Joe Haldeman last semester. He’s a science fiction author, and one of my idols. His pen is sharp, acerbic, and his sense of irony is diamond-tipped. When I first read his books, of course, I understood none of this. Take his classic, The Forever War. It’s a fantastic military science fiction adventure. His characters are clear, his future physics (always a sticking point for writers of realistic sf) is spot-on, his combat scenes are intense. These are the things I understood when I was in high school. I had a very different politics then, too, and so I understood Haldeman’s universe as an ugly, territorial place. Civilized humanity was right to fight the Taurans for its little corner of the cosmos, and when it turned out that the whole conflagration was based on a misunderstanding, well, at least we had the war heroes and their noble sacrifice. It was classic Greek tragedy, with aliens. Later, after college, I encountered and was absorbed into a more complicated political universe, one with a less definite phenomenology and a murkier ethics. I reevaluated what I knew of American history. As historians love to say, I “complicated the narrative.” And I read The Forever War again, this time at a level beyond its value as an exciting hard-sf romp. Before extraordinary renditions, CIA black sites and waterboarding, before the invasion of Iraq, before the rise of a shrill, reactionary opposition after November 2008, The Forever War was a good story. Now, for me, it’s a morality tale about the human cost of war in the era of acronyms. It’s about the danger of our enduring faith in superweapons, and about our damning tendency to shoot first. And it’s about a crucial lesson of the war in Vietnam: that understanding war only in the tragic mode does a disservice to the dead by absolving everyone, top to bottom, of responsibility. So now I put it to you, hugemistakers: what books have you re-read, and what has that re-reading meant to you?